Ohhh look, an outfit post! After a whole month of blogging my outfit every single day I suddenly got really busy and ran out of time to take pictures, but now I'm back and I should be able to get at least a couple of outfits up a week (which makes me really happy because they're my favourite kind of post to write)... Also, before anyone asks, I haven't dyed my hair... it just looks really light here for some reason, blame the camera! I popped into town with Elodie and Robbie today, mainly to pick up Elodie's Halloween costume... she has to dress up for nursery and she's adamant that she wants to dress up as a pumpkin, which definitely isn't the easiest costume to find, but in the end we managed to get her one, and it's actually really cute! This is the first time I've worn my new coat because I've been living in my burgundy one from H&M, but this one is just gorgeous. It's a lot smarter and more formal than the other one and such a statement piece, it's also great that I've now got a choice of coats. I think you all know how much I love a monochrome outfit, and this just finishes it off perfectly. I'm a big fan of the oversized dogtooth print and the leather look edging too... best of all, it's such a bargain - especially as Zara are selling the exact same coat (here) for almost four times the price! Dupe alert! I don't think the coat works too well with a fancy or in your face outfit, so I just wore a black skater dress which compliments it perfectly. I think any block of colour would go fine with the coat, so it's still really wearable. I pulled all the gold hard wear together with a similar coloured necklace, my Zara City Bag (which seems to have lost it's shape... am I right?) and my new boots, which I'm also kind of loving at the moment. I never used to be too interested in shoes, but this past year I've definitely developed some kind of obsession. These boots are ideal for everyday wear, they're so comfy, easy to walk in and they go with almost anything. The little ankle boot style is exactly what I love, and the detailing of the buckles with little studs just makes them that little bit different and more special. I can promise you I will be wearing these until they fall apart - prepare yourselves to see them in the majority of my outfit posts this Winter! I took a few outfit photos yesterday too, so I'll get those up over the weekend. I'm going to make a conscious effort to blog as often as possible, which will probably end up being every other day... I hope that's okay! Have a lovely night, I'm going to catch up with Hollyoaks (which has been AMAZING this week!) and have an early night. Those boots are cracking!! Ankle boots are all I'm wearing at the moment ! I love that coat - that pattern is really cool! 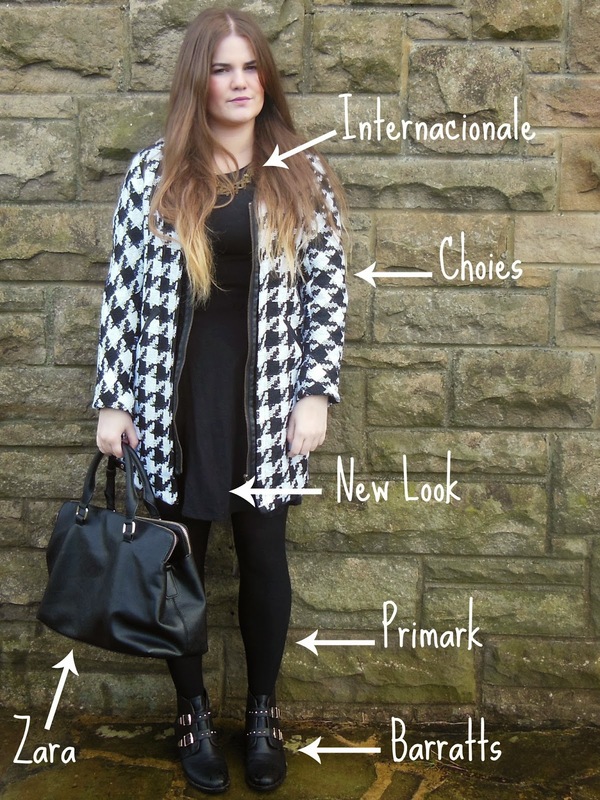 I really need a new coat at the moment so I might have to check out Choies if they're doing dupes like this one! Aw you look amazing, I love that coat. The whole outfit looks so expensive! Ooo. What's the sizing like on the coat?